Table of Contents Next: Clowes, Cyril A. Modern warfare is characterized by death at a distance. Small arms and grenades were the weapons of choice even in close infantry engagements. However, there were numerous actions in the Pacific War where the combatants came close enough to try to stab or club each other rather than shoot each other. Such situations were most likely to occur in dense jungle or urban settings, particularly at night. 1. THE SPIRIT OF THE BAYONET The will to meet and destroy the enemy in hand-to-hand combat is the spirit of the bayonet. It springs from the fighter's confidence, courage, and grim determination, and is the result of vigorous training. Through training, the fighting instinct of the individual soldier is developed to the highest point. The will to use the bayonet first appears in the trainee when he begins to handle it with facility, and increases as his confidence grows. The full development of his physical prowess and complete confidence in his weapon culminates in the final expression of the spirit of the bayonet—fierce and relentless destruction of the enemy. For the enemy, demoralizing fear of the bayonet is added to the destructive power of every bomb, shell, bullet, and grenade which supports and precedes the bayonet attack. It was a morale booster for us rather than a weapon. The soldier would let out a yell and charge forward with his bayonet. But the killing and wounding was done with bullets. Men were killed with bayonets but it was uncommon. This was true with American forces also. The Jap always had a bayonet on the end of his rifle. It was part of their system of indoctrination.... Some of the Japs that were hit tried to get the rifle off their shoulder and charge us with their bayonet. We killed them first. It must have been reflex for the Japanese, a product of training. It was not our way. Nevertheless, there were a small number of Allied bayonet charges during the war. During the battle of "Coffin Corner" on Guadalcanal, 26 October 1942, Marine sergeant Mitchell Page led a bayonet charge against a Japanese penetration and was subsequently awarded the Medal of Honor. 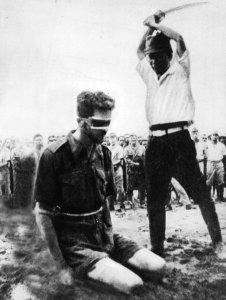 British officers ordered a bayonet charge as late as 1944 in central Burma, and the Japanese never gave up their fondness for cold steel. Almost all bayonets were knife bayonets with offset socket mountings that allowed the rifle to be fired while the bayonet was attached. Prior to the First World War, considerable emphasis was given to the "reach" of the bayonet/rifle combination, but the experience of the trenches taught the major powers that this was of little significance. 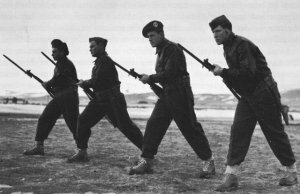 Postwar bayonets were designed with more emphasis on keeping the bayonet/rifle combination from becoming unwieldy and on the dual use of the bayonet as a field utility knife. The exception was the Japanese Army, which had had less experience with trench warfare and insisted on a long bayonet for the already relatively lengthy Arisaka rifle. ... two enemy officers crept up the steep slope, threw grenades into the gun emplacement, and jumped in swinging their samurai sabers. One Marine had parried a saber blow with his carbine. His buddy then had shot the Japanese officer who fell backwards a short distance down the slope. The saber blow had severed a finger and sliced through the walnut carbine forestock to the metal barrel. "... for a samurai the sword is the materialization of the soul" (Edgerton 1997). The Japanese put far more emphasis on close combat weapons than the Western powers. This reflected the Japanese emphasis on morale over firepower, but may also reflect a lingering belief that small arms were "ignoble" (Edgerton 1997). As previously noted, the Japanese Arisaka rifle had a relatively long barrel and came with an unusually long bayonet, the Model 30, with a 15" (38 cm) blade and an overall length of 20" (51 cm). This gave the Japanese infantryman an unmatched "reach" with the rifle/bayonet combination. On the other hand, the combination was quite unwieldy, and a Japanese soldier whose bayonet thrust was parried was left highly vulnerable. However, the bayonet became the symbol of the Japanese enlisted soldier, who proudly wore it in a scabbard when on leave as if were a samurai sword. The sword had a special significance to the Japanese military, since the carrying of swords was long the exclusive right of the samurai class. A number of senior officers owned samurai swords passed down as family heirlooms, but the vast majority of Japanese officer swords were mass-produced weapons of no great value. Of limited usefulness in combat, the officer sword was too often used in beheadings of Allied prisoners of war or subject peoples. The last desperate Japanese counterattacks on Saipan included a number of wounded Japanese who were equipped with improvised weapons, such as bamboo poles with a knife tied to the tip. Bamboo spears were also the only weapons available for most of the civilians hastily conscripted into militia formations to defend against the anticipated Allied invasion of the home islands. The Japanese faith in the superiority of their troops in close combat was likely misplaced. The average Japanese soldier was about five inches (3 cm) shorter than the average American soldier, and weighed perhaps 40 pounds (20 kg) less. Notwithstanding the reputation of Asian cultures for martial arts, the ordinary Japanese soldier could not be given enough training in close combat to overcome the disadvantage in size. The U.S. Army M1 Bayonet was a relatively short bayonet (10" or 25cm blade with a 4" or 10cm handle) designed to fit either the M1 Garand rifle or older Springfield 1903 rifles. 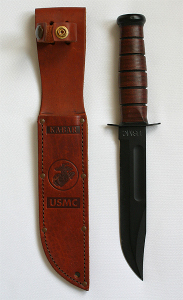 We were introduced to the Marine's foxhole companion, the Ka-Bar knife. This deadly piece of cutlery was manufactured by the company bearing its name. 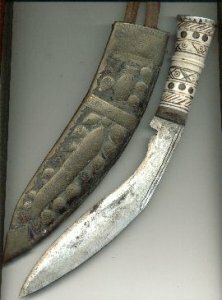 The knife was a foot [30 cm] long with a seven-inch-long [18cm] by one-and-a-half-inch-wide [4 cm] blade. The five-inch [13 cm] handle was made of leather washers packed together and had "USMC" stamped on the blade side of the upper hand guard. Light for its size, the knife was beautifully balanced. "Everyone has heard a lot about all those kinds of fancy fighting knives that are, or should be, carried by infantry troops: throwing knives, stilettos, daggers, and all that stuff. Most of it is nothing but bull. Sure, you'll probably open more cans of C rations than Japs with this knife, but if a Jap ever jumps in your hole, you're better off with a Ka-Bar than any other knife. It's the very best and it's rugged, too. If you guys were gonna fight Germans, I'd guess you'd never need a fighting knife, but with the Japs it's different. I guarantee that you or the man in the next foxhole will use a Ka-Bar on a Jap infiltrator before the war is over." He was right. Commonwealth forces used a variety of bayonets during the Second World War, including both spike and knife bayonets, but knife bayonets were far more common because of their dual use as utility knives. But the most celebrated Commonwealth close combat weapon was doubtless the Gurkha kukri, a knife with a heavy curved blade up to 15" (38 cm) in length designed for chopping. 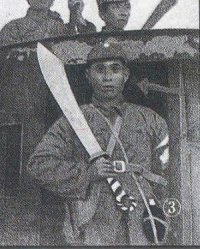 Lacking other forms of firepower, the Chinese soldier was very likely to be armed with a dadao sword for close combat. This was a heavy two-handed sword with a 2' to 3' (60cm to 90cm) blade that was relatively easy for untrained troops to use.